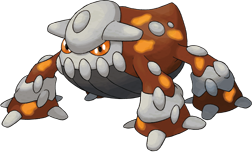 Heatran does not evolve/is not evolved into. X It dwells in volcanic caves. It digs in with its cross-shaped feet to crawl on ceilings and walls. X Es lebt in vulkanischen Höhlen. Mit seinen kreuzförmigen Klauen kann es sogar an der Decke laufen. X Il hante les grottes volcaniques. Il rampe au mur et au plafond grâce à ses pieds en forme de croix. X Habita cuevas volcánicas. Cava con sus pies en forma de cruz para trepar por techos y paredes. X Vive nelle cavità dei vulcani. Scava con i suoi piedi a croce per scalare pareti e arrampicarsi sui soffitti. X 화산의 동굴에서 서식한다. 십자형의 발톱을 박아서 벽이나 천장을 돌아다닌다. Y Boiling blood, like magma, circulates through its body. It makes its dwelling place in volcanic caves. Y Das Blut, das durch seinen Körper fließt, brodelt heiß wie Magma. Es lebt in vulkanischen Höhlen. Y Le sang de ce Pokémon des cratères bouillonne dans son corps comme du magma. Y Su sangre fluye ardiendo como si fuera magma. Vive en cráteres de volcanes. Y Nel suo corpo scorre sangue che ribolle come magma. Vive in antri all’interno di vulcani. Y 마그마처럼 타오르는 혈액이 몸에서 흐르고 있다. 화산의 동굴에 서식한다. Omega Ruby Boiling blood, like magma, circulates through its body. It makes its dwelling place in volcanic caves. Omega Ruby Das Blut, das durch seinen Körper fließt, brodelt heiß wie Magma. Es lebt in vulkanischen Höhlen. 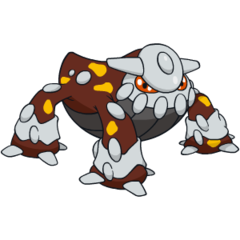 Omega Ruby Le sang de ce Pokémon des cratères bouillonne dans son corps comme du magma. Omega Ruby Su sangre fluye ardiendo como si fuera magma. Vive en cráteres de volcanes. Omega Ruby Nel suo corpo scorre sangue che ribolle come magma. Vive in antri all’interno di vulcani. Omega Ruby 마그마처럼 타오르는 혈액이 몸에서 흐르고 있다. 화산의 동굴에 서식한다. Alpha Sapphire It dwells in volcanic caves. It digs in with its cross-shaped feet to crawl on ceilings and walls. Alpha Sapphire Es lebt in vulkanischen Höhlen. Mit seinen kreuzförmigen Klauen kann es sogar an der Decke laufen. Alpha Sapphire Il hante les grottes volcaniques. Il rampe au mur et au plafond grâce à ses pieds en forme de croix. Alpha Sapphire Habita cuevas volcánicas. Cava con sus pies en forma de cruz para trepar por techos y paredes. Alpha Sapphire Vive nelle cavità dei vulcani. Scava con i suoi piedi a croce per scalare pareti e arrampicarsi sui soffitti. Alpha Sapphire 화산의 동굴에서 서식한다. 십자형의 발톱을 박아서 벽이나 천장을 돌아다닌다. Diamond It lives at the crater of a volcano. It crawls around by digging its cross-shaped claws deep into the walls or ceilings. Pearl It lives at the crater of a volcano. It crawls around by digging its cross-shaped claws deep into the walls or ceilings. Platinum Its body is made of rugged steel. However, it is partially melted in spots because of its own heat. SoulSilver Boiling blood, like magma, circulates through its body. It makes its dwelling place in volcanic caves. Black Its body is made of rugged steel. However, it is partially melted in spots because of its own heat. White Its body is made of rugged steel. However, it is partially melted in spots because of its own heat. White 2 Its body is made of rugged steel. However, it is partially melted in spots because of its own heat.